The Scottish Guitar – Publication Release! My book, The Scottish Guitar – 40 Scottish Tunes For Fingerstyle Guitar has just been published by Centerstream with distribution globally by Hal Leonard. Read more at the Hal Leonard website. It is available from the usual outlets. Rob MacKillop is regarded as one of Scotland’s finest musicians. 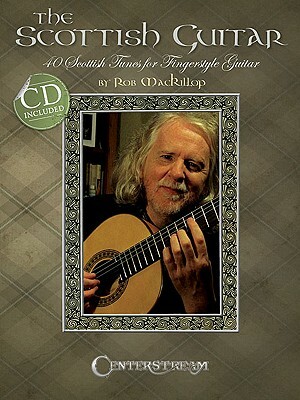 In this groundbreaking book, he defines a uniquely Scottish way of playing the guitar, incorporating rich traditions into later material – from Gaelic songs to traditional airs and dances. His arrangements reflect the origins of the tunes, with appropriate ornaments and phrasing. The accompanying CD helps players gain a deeper understanding of the subtle art of phrasing. Tunings used are DADGAD, Open D and Open G.
Just got my copy yesterday and I’m already a big fan. Given how tricky the rhythm and timing is with Scottish music (at least for me), the CD is very, very helpful. I would actually say that the CD could be a stand-alone product and I’ve been listening it this evening. I’ll have to get around to leaving some good feedback on Amazon.